It’s the best time of year! Theme parks are gearing up for their annual Halloween Takeover Events, where a lot of the “family friendly” luster gets taken over by “dark and sinister.” Yes! We’ve all got our favorite theme park Halloween spots, and although some parts of the country seem to have a lions’ share of Halloween Haunts (yo, LA, we’re looking at you), it’s safe to say that all across the country, fans are within driving distance of one of these Theme Park Haunts. First, check out our SCARE GUY SHOW rundown, where we discuss the 13 TOP THEME PARK HALLOWEEN EVENTS…. 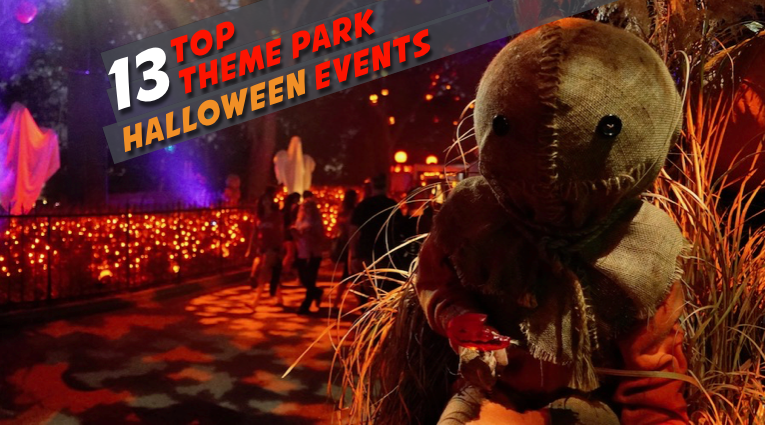 the list is mainly based on The Travel Channel’s annual list of Halloween Theme Park Events, with a few personal favorites thrown in. Check it out…. then see our complete list below! It’s hard to argue against Universal Orlando’s perch atop this list. That’s not to say that other theme parks aren’t top-notch, but unless you’ve attended this event, it’s hard to understand just how IMMENSE and ALL-CONSUMING it is. I may be a bit biased because I’ve attended this event every year for the past 15 years (NEVER disappointed! ), but Orlando Horror Nights is the closest I’ve ever experienced to actually LIVING the nightmares, and the movies they’ve sprung from. The costumes and houses are professional and convincing, the music and atmosphere is truly remarkable — and they’ve got a bar set up on every corner (unlike their Hollywood counterpart). Orlando may hold the top spot, but the Hollywood version is no slouch. As a matter of fact, some people prefer this version over the Orlando one. Why? Mainly because the Terror Tram is a can’t-be-topped horror spectacle. And also because we’re in stinking Hollywood folks — the best horror maestros anywhere in the world are RIGHT HERE. The makeup, the sets, the presentation. It’s all WOW. Double wow. It’s already a top thrill park, fighting it out with Cedar Point for the title of “Roller Coaster Capital of the World.” But add in Halloween, and this park gets nuts as zombies and ghouls take over the park. Fright Fest has several mazes and scare zones located throughout the park, along with tons of roller coasters IN THE DARK! And if you’re in Southern Cali for Universal Studios Hollywood and Knott’s Scary (and maybe even Disneyland), make a point to spend an evening here. This attraction in Laguna Beach, Ca, has three floors and over 150,000 square feet of terror. According to the rep we talked to, they’ve actually taken over an abandoned mall, and are filling it with rides, haunted houses, scare zones, stage shows, and more. Although not technically a theme park, per se, these folks basically build a horror theme park each year, and this one looks like it might be their best year yet! Florida’s version of the Halloween party starts waaaaaaaay early (just days away!)…. for crying out loud, it’s in stinking August. And as you well know, August in Florida is scary enough–the heat and humidity will kill you! But this party packs a whole lot of Mickey pizzaz, and it has the best night-time fireworks show of any Halloween event ANYWHERE! Florida folks should count their blessings, because they have an abundance of awesome theme park haunts–especially Central Florida. In addition to Universal’s Halloween Horror Nights Orland, and Mickey’s Not So Scary, guests can also take in the sights and frights of Howl-O-Scream at Busch Gardens, Tampa, Florida. This year, the Williamsburg outpost of Busch Gardens is celebrating 20 years of fears and an all-new Era of Terror with more scares than ever. Fear awaits in the Virginia theme park’s collection of elaborate haunted houses, immersive themed scare zones, challenging escape rooms and darkly entertaining live shows. Cedar Point’s event is a bit different–it’s not an extra hard-ticket event. Nope. It’s actually included in the price of admission. How’s that for a Halloween treat? HalloWeekends is Cedar Point’s annual fall celebration of rides, roller coasters and sinister haunted attractions. Check out their selection of haunted mazes and outdoor scare zones, along with live shows and other surprises, all included with park admission. Fear is waiting for you at HalloWeekends! Fright Dome, Circus Circus, Las Vegas, select days in Oct.
It’s Vegas, baby! Yeah! How cool to experience a huge Halloween theme park right on the Vegas strip — that’s exactly what you’ll get with Circus Circus. Named as one of the best haunted houses in the nation by USA TODAY’s “10 Best for 2015” and recognized as one of the nation’s most extreme haunted attractions for 2014 by Travel Channel, Fright Dome will feature 250,000 scare feet of fear, taking over the Adventuredome at Circus Circus Las Vegas the entire month of October. Throw some dice and bet on this event to be pretty awesome… and we love the way they advertise themselves as “extreme.” Vegas ain’t for kiddies, folks! This is my old stomping grounds when I was growing up in South Carolina…. a lot of you may have never heard of Carowinds. It’s a really top-notch regional theme park right on the border between two states–South and North Carolina. They haven’t posted this year’s promo video yet, but check out this video from last year’s opening night.